I always wanted to go to the pizzeria but I couldn't find it. I thought it could be closed down. Brixton Village is separated 2 parts and I always go only one of them which has a lot of cafes and cute shops. 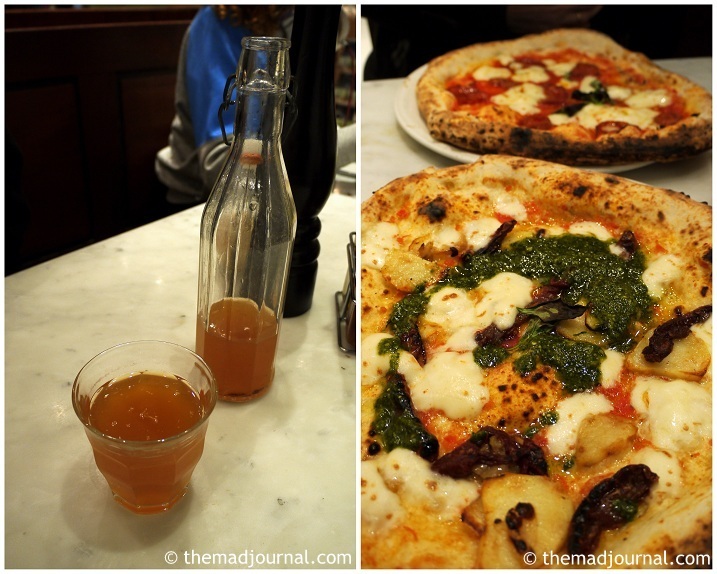 Last weekend, we went to another part to look for cafes and we found the pizzeria. The pizzeria is really popular and there was a queue. Although my partner was so hungry and irritated as we had to leave a cafe earlier, he loves pizza so we decided to queue. The interior is really simple. As pizza is Italian fast food, it seems that they want to serve customer as many as possible. I didn't feel that I can relax and chill out for a while there, but they serve REALLY quick. We were queuing but we got our pizza as soon as we sat at table. Pizza is cooked with wood in the brick oven. Their home made lemonade looks orange like orange juice! The taste is natural and delicious. It's definitely one of the best 5 in London. I love thin pizza and the dough had a nice elasticity and consistency. I usually don't like sourdough, but it didn't have the specific taste of sourdough. I don't really see the pizza with potato, but it was really yummy! There's another branch near our town, I'd love to go there again.